Q. What is a large truck or heavy truck? A. Large trucks weigh more than 10,000 pounds and can be either single-unit vehicles or combination vehicles consisting of a single-unit truck or tractor pulling one or more trailers. The federal commercial vehicle maximum weight standard on the interstate highway system is 80,000 pounds gross vehicle weight, unless a higher maximum weight existed on the state level before July 1, 1956. Off the interstate highway system, states may set their own commercial vehicle weight standards. In most states, the maximum permitted length for a single trailer is 53 feet. Tractors pulling two 28-foot trailers are known as twins or western doubles. Trucks that are even bigger than western doubles are allowed to travel on some roads, including Kansas Highways. These trucks, called longer combination vehicles, either have three trailers or at least two, one of which is 29 feet or longer, or the tractor and two trailers have a combined weight exceeding 80,000 pounds. Longer combination vehicles are prohibited in many states and are allowed only in states that permitted them prior to June 1, 1991. Q. Do heavy trucks, semi-trailers, tractor-trailers & 18-wheelers have high crash rates or high fatality rates? A. On average, drivers of large trucks travel many more miles than passenger vehicle drivers, and a high proportion of those miles are on interstates, which are the safest roads. In 2008, large trucks accounted for 4 percent of registered vehicles and 8 percent of miles traveled.1 Per unit of travel, large trucks are involved in more fatal crashes than passenger vehicles — 1.7 crashes per 100 million miles traveled in 2008 for large trucks, compared with compared with 1.4 for passenger vehicles. Large trucks have a much lower rate per mile traveled of crashes resulting in injuries or property damage only compared with passenger cars and light trucks. Q. Who typically dies in crashes involving heavy trucks, semi-trailers, tractor-trailers & 18-wheelers? A. In 2008, about 4,000 people died in crashes involving large trucks. Fifteen percent of these deaths were truck occupants, 69 percent were passenger vehicle occupants, and 14 percent were pedestrians, bicyclists, or motorcyclists. In fatal two-vehicle crashes involving a passenger vehicle and a large truck, 97 percent of the deaths were the occupants in the passenger vehicles. Large trucks accounted for 4 percent of registered vehicles and 8 percent of vehicle miles traveled in 20081 but were involved in 11 percent of all motor vehicle crash deaths and 23 percent of passenger vehicle occupant deaths in multiple-vehicle crashes. A. Are trucks with more than one trailer more likely to be involved in serious injury collisions? A. Multiple-trailer trucks have more handling problems than single-trailer trucks. 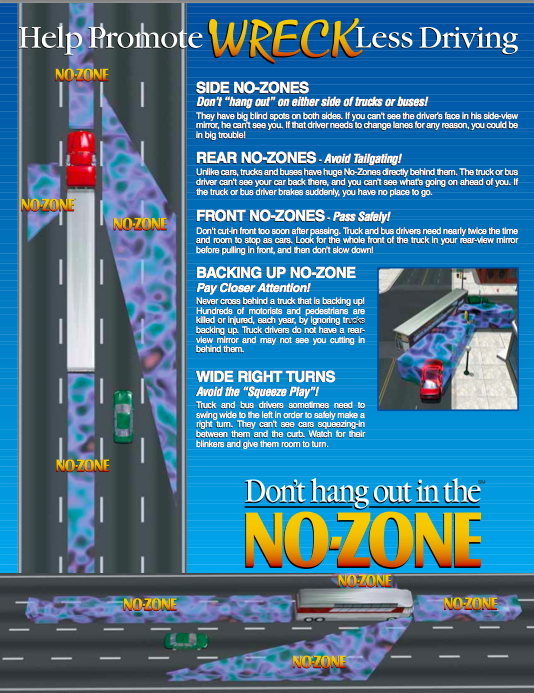 In general, the additional connection points contribute to greater instability, which can lead to jackknifing, overturning, and lane encroachments. But the relationship between multiple-trailer trucks and crash risk is not firmly established. A study in Washington state found that doubles (tractors pulling two trailers) were two to three times as likely as other rigs to be in crashes,3 but a study in Indiana found that doubles did not show increased crash risk except on roads with snow, ice, or slush.4 One mitigating factor may be that doubles often are operated by drivers with good safety records working for large companies with active safety programs. Q. What agencies are responsible for commercial vehicle and heavy truck safety? A. Two US Department of Transportation agencies plus individual states oversee large truck safety. The National Highway Traffic Safety Administration (NHTSA) sets standards for new truck equipment and has some jurisdiction over equipment standards for trucks currently on the road. The Federal Motor Carrier Safety Administration (FMCSA) oversees the safety of commercial vehicles in interstate commerce (vehicles operating across state lines). FMCSA regulations cover equipment, licensing, hours of service, and vehicle inspection and maintenance. States regulate intrastate trucks (trucks operating only within a single state's borders), and state inspectors are the primary enforcers of the federal rules for equipment, hours of service, and vehicle maintenance and inspection. In Kansas, the Kansas Highway Patrol conducts random inspections of 18-wheelers and other heavy trucks. KHP troopers also operate weigh stations where they check truckers' log books, vehicle weights, and conduct inspections looking for defects in the air-brake systems of heavy trucks, problems with trailer couplings, and other dangerous conditions. Some cities in Kansas, especially in Johnson County, have police officers who are certified to conduct inspections of commercial vehicles such as semi-trucks, tractor-trailers, 18-wheelers, etc. For instance, Overland Park police officers write hundreds of heavy truck defect tickets/citations each year. These tickets carry the same weight as those issued by the KHP. In Missouri, the Missouri Highway Patrol conducts inspections of semi-trailers, tractor-trailers, and other heavy trucks. These inspections include looking for vehicle defects (such as braking or coupling problems), insuring compliance with Federal regulations regarding hours driven, and checking driver's sobriety. Q. Is a special driver's license required for driving a heavy truck? A. Yes. Licensing drivers is a state matter, but since 1992, federal law requires states to meet licensing standards for commercial driver's licenses (CDLs). Prior to 1992, a few states allowed any driver licensed to drive an automobile to drive a large truck or bus, and other states had weak testing and licensing standards for commercial drivers. Since 1992, federal law has established testing, licensing, and health standards for issuing CDLs. Both interstate and intrastate commercial drivers must obtain such licenses if they operate trucks with gross vehicle weight ratings of 26,001 pounds or more, if they transport 16 or more passengers, or if they transport hazardous materials. A national database of all CDL holders helps to deter truckers from using multiple state licenses to conceal their traffic convictions and also prevents disqualified drivers from being licensed. A. Is driver fatigue a cause of serious injury and fatality crashes involving 18-wheelers, semi-trucks, tractor-trailers, and other commercial vehicles? The Institute found that truck drivers reporting hours-of-service violations were more likely to report having fallen asleep behind the wheel during the past month.13,14 Based on a study of a national sample of large truck crashes, Blower and Green (2009) found that hours-of-service violations and logbook out-of-service violations increased the likelihood that a crash-involved truck would be determined to have precipitated the crash.15 The proportion of large truck crashes for which fatigue is a contributing factor is uncertain. Q. How long can a heavy truck driver legally drive (hours-of-service) before they are required to rest? A. In January 2004, FMCSA implemented new hours-of-service regulations for truck drivers, increasing the required daily off-duty period but also increasing daily and weekly allowable driving times. Under the current rules, interstate commercial truck drivers are not allowed to drive more than 11 hours or drive after 14 hours since starting a duty shift until they take a 10-hour break. Drivers cannot drive after accruing 60 work hours during a 7-day period or 70 work hours during an 8-day period, but a "restart" provision allows truckers to get back behind the wheel after 34 hours off duty. Using this provision, a driver may log up to 77 hours in 7 days or 88 hours in 8 days. Further modifications to the work rules took effect Oct. 1, 2005. These revisions provide that drivers who use sleeper berths in their trucks may split the required minimum 10-hour daily off-duty period into a period of at least 8 hours in the sleeper berth and a period of at least 2 hours in the sleeper berth or off duty. Short-haul truckers may extend their work day twice a week, and these drivers are exempt from a requirement to carry a logbook of their hours of work. Federal courts overturned the rules in 2004 and again in 2007. In October 2009, FMCSA reached a court settlement with safety groups. Under the terms of the deal, FMCSA agreed to review and reconsider the rule and to publish a final rule by July 2011. Q. How are hours-of-service (work restrictions) rules enforced? A. Current regulations allow truck drivers to record their hours in written logbooks that are reviewed by inspectors. Studies of long-distance truck drivers have found that work rules commonly are violated.13,14,16 About a third of drivers interviewed by the Institute in 2003, 2004, and 2005 admitted to often or sometimes omitting hours from their log books.14 Some truck drivers refer to logbooks as "comic books" because they are so easily falsified. Onboard computers reduce opportunities for violating the rules because they automatically record when a truck is driven. Beginning in the 1980s, Europe required mechanical (nonelectronic) tachographs, designed to record vehicle travel hours. Mechanical tachographs can be falsified more easily than onboard computers, so as of May 2006, new trucks and intercity buses registered in the European Union must be equipped with electronic recording devices. The Institute and five other organizations petitioned the US Department of Transportation in 1995 to require the installation and use of tamper-resistant electronic onboard computers on commercial vehicles whose drivers are required to maintain written logbooks.17 The National Transportation Safety Board also has repeatedly recommended that such recorders be mandated. In 2000, FMCSA proposed to require these devices in all large trucks, but dropped the proposal from the work-hour rules that took effect January 2004. Under a final rule issued in April 2010, commercial truck and bus carriers must install electronic onboard recorders fleetwide if violations of hours-of-service rules are uncovered in 10 percent or more of fleet records during a single compliance review. The requirement goes into effect in June 2012. FMCSA estimates that 5,700 carriers would be affected during the first year of the rule. This represents a small fraction of all carriers. There were an estimated 715,000 interstate motor carriers in 2008,18 and about 16,500 motor carrier safety compliance reviews of carriers were conducted in 2009.19 The rule also established technical performance standards for recorders rather than a single design standard. A large number of trucks already are equipped with onboard recorders. About 45 percent of the long-distance truck drivers interviewed by the Institute in 2005 said their trucks had electronic onboard recorders, up from about 18 percent in 2003 and 38 percent in 2004. Of the drivers who reported having recorders, only 10 percent or fewer said they used them in lieu of paper logbooks to show compliance with the work rules.14 A large proportion of trucks also are equipped with global positioning systems (GPS) which also indicate when trucks are in motion. Q. Is drunk driving or drugged driving a problem with drivers of heavy trucks, tractor-trailers, 18-wheelers, and semi-trailers? A. Yes. Although alcohol is much less of a problem among truck drivers than among passenger vehicle drivers, in 2008, 4 percent of fatally injured large truck drivers had blood alcohol concentrations (BACs) at or above 0.08 percent, compared with 35 percent of fatally injured passenger vehicle drivers. Drunk driving is clearly a problem with fatal or serious injury accidents involving commercial vehicles and heavy trucks. Q. Is defective equipment a cause or contributor to 18-wheeler, semi-truck, tractor-trailer, or other heavy truck injury accidents and fatal accidents? A. In the late 1980s, Insurance Institute of Highway Safety researchers examined crashes of large trucks in the state of Washington and found that tractor-trailers with defective equipment were twice as likely to be in crashes as trucks without defects.27 Brake defects were most common; they were found in 56 percent of the tractor-trailers involved in crashes. Steering equipment defects were found in 21 percent of crash-involved trucks. Q. How are the stopping distances for heavy trucks compared to passenger cars and pickup trucks? A. Compared with passenger vehicles, stopping distances for trucks are much longer. On wet and slippery roads, there are even greater disparities between the braking capabilities of large trucks and cars. In July 2009, NHTSA issued a final rule decreasing the maximum stopping distances for air-braked trucks by 30 percent. The rule will go into effect on August 1, 2011 for three-axle tractors with a GVWR of 59,600 pounds or less. Two-axle tractors and tractors with a GVWR above 59,600 pounds must meet the reduced stopping distance requirements by August 1, 2013. Q. What is a "under-ride" crash involving an 18-wheeler, semi-truck, tractor-trailer, or other commercial vehicle? A federal rule to upgrade the rear-impact guard standard for new trailers took effect in January 1998. Several truck types are exempt from the rule, including straight trucks, and wheels-back trucks, and various types of special purpose trucks. The effects of the improved guard in preventing deaths and injuries in rear impact crashes are unknown. Regulations in Canada require stronger rear underride guards than in the United States. There is no requirement for front or side underride guards in the United States. European Union regulations have required front underride guards on large trucks since 2003. Underride guards have been required on the sides of trucks since 1989. These guards are primarily intended to protect pedestrians and bicyclists. The regulations in Canada impose more stringent requirements for rear underride guards than US regulations. Q. Are Canadian and/or Mexican trucks and drivers allowed to drive heavy trucks in the United States? A. Canadian trucks are allowed to deliver loads from Canada and pick up loads with a Canadian destination but generally cannot pick up US loads with a US destination. With the signing of the North American Free Trade Agreement (NAFTA) in 1992, Mexico and the United States agreed to permit cross-border trucking within both countries by the end of 1995. However, most Mexican trucks still are restricted to border cities because of concerns about Mexican motor carriers' ability to meet US safety and insurance requirements. Currently, only a few approved carriers can drive beyond the border cities. A demonstration project beginning in 2007 allowed 27 Mexican trucking companies to operate long-haul within the United States. The trucks from these carriers could transport freight between Mexico and the US beyond the border zones but were not authorized to make deliveries between US cities. The trucks had to satisfy all US safety requirements and were inspected every time they crossed the border and traveled beyond the border cities. Eight percent of inspections of these trucks during September 2007-September 2008 resulted in a vehicle out-of-service violation. The driver out-of-service rate was less than one percent. This was lower than the overall out-of-service rates for US carriers inspected during the same time period.32 FMCSA terminated the demonstration project in 2009. Data on the crash experience of Mexican trucks are insufficient to determine if they have a higher crash risk than US trucks.